The GoPro Chesty makes it easy to capture immersive video and photos from, well... your chest. It's perfect for skiing, mountain biking, motocross, paddle sports or any activity where you want a more engaging, lower-than-the-helmet view of the action. You'll capture more of your arms, knees, poles and skis while skiing - and more of your arms and handlebars while biking or riding your motorcycle. 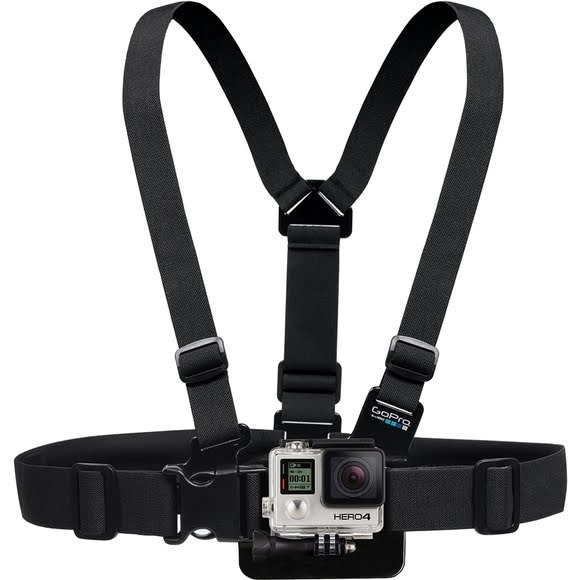 The GoPro Chesty makes it easy to capture immersive video and photos from, well... your chest. It&apos;s perfect for skiing, mountain biking, motocross, paddle sports or any activity where you want a more engaging, lower-than-the-helmet view of the action. You&apos;ll capture more of your arms, knees, poles and skis while skiing - and more of your arms and handlebars while biking or riding your motorcycle. Fully adjustable to fit a wide range of adult sizes. The Junior Chesty is available for kids and adolescents. Note: GoPro camera shown in photo not included.